2012 is not the end of the world. It is the end of a system which has brought our world to a state of such inequality, unfairness and imbalance, that we can no longer survive without drastic changes of priority and direction. In 2012, it will finally dawn on those who are currently controlling life on Earth that a huge portion of the population is wide awake, powerful, watching their every move, and angry! And yet, the majority of people are proceeding in a peaceful and solution-oriented way, with determination and hope for a better future. Humanity’s desire for real and positive change is starting to outweigh our primitive need for revenge and our inclination for war. Anger is not meant to be used as a weapon. Anger is a natural reaction to pain – and pain takes many forms. Anger is a vital emotion which pushes us to find solutions to problems that are hurting us. When properly understood, anger is an instrument of constructive change – and constructive change is what 2012 is all about. The fact that life doesn’t have to be this way has penetrated mass consciousness. The emotional antenna of humanity has kicked into gear and people are starting to feel and sense the truth, rather than rely on others to tell us what’s what and go passively along with the program. We are all fellow travelers on the road of life, but we are not all the same. 2012 is a 5 global year (2+0+1+2=5), and 5 represents everything that is “different”. 5 is the number of DIVERSITY. The acceptance of diversity is the acceptance of differences… which is PEACE. “It is amazing how fast your life can change…. 5 is the number of ACTION. 5 is alive with movement. 5 is a hive of activity. In 2012, this means facing reality and having the faith to steer ourselves along unbeaten paths that we’re creating as we go. We need to be fully engaged now, and ready to adjust to new and unexpected realities. If we just watch everything unfold on the TV or internet like it’s some kind of entertainment, we’ll be very shocked when suddenly we are part of what is unfolding. We are going to have to be at our most resourceful and creative. And out of this, we will develop STYLE. Our individual styles have been washed away by mediocrity, uniformity, monotony, and sameness. To be who we are, we must heal our fear of being different. 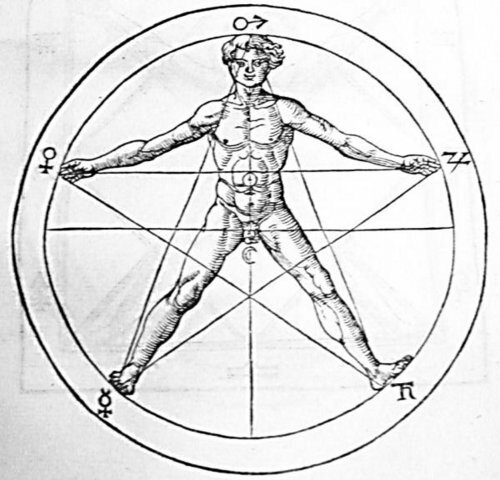 The main symbol of 5 is the shape of a pentagon. 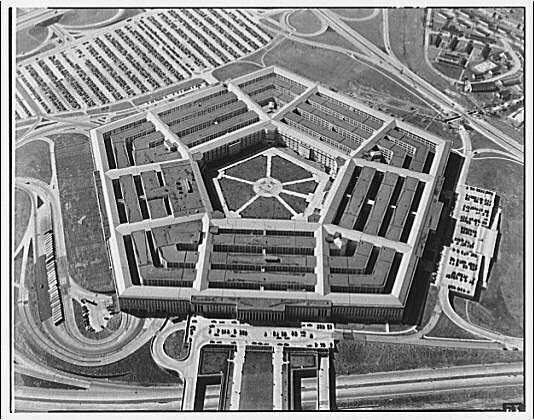 No doubt we’ll be seeing a lot of America’s military headquarters in 2012 as it is the largest pentagon-shaped structure on Earth. From the very start of 2012 there has been talk of attacking Iran. But, on January 5, President Obama announced a reduction in defense spending. “After a decade of war, we are turning a new page… the tide of war is receding”, he said. Let’s hope so. He also spoke of learning from the mistakes of the past, which is a major principle of the 5 energy. The pentagon shape also resembles a house. With so many people homeless now, and so many houses just sitting empty all over the world, something innovative needs to be done to help people attain the basic need of shelter. 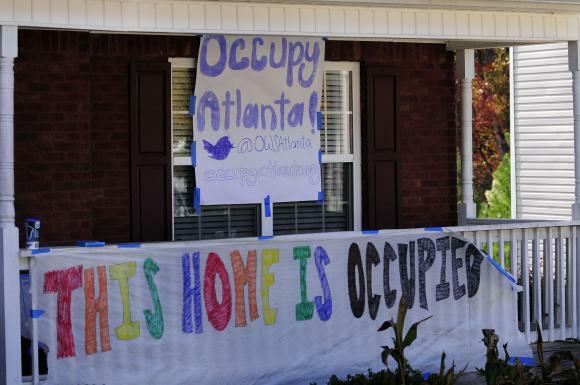 Towards the end of 2011, (a 4 global year symbolized by the natural shape of the square), the Occupy Movement in the USA and other countries started to move in that direction by occupying foreclosed homes. The Occupy Movement, the Arab Spring and other extraordinary uprisings of the human will, all emerged out of city squares, plazas and parks. That movement must expand now. The square symbolizes limitation and breakthrough. The protesters (pioneers) certainly came up against limitation in 2011, but they also achieved many important breakthroughs that have set the stage for the changes yet to come. Which direction will this movement take now that the limited square has transformed into a pentagon and 5-pointed star? 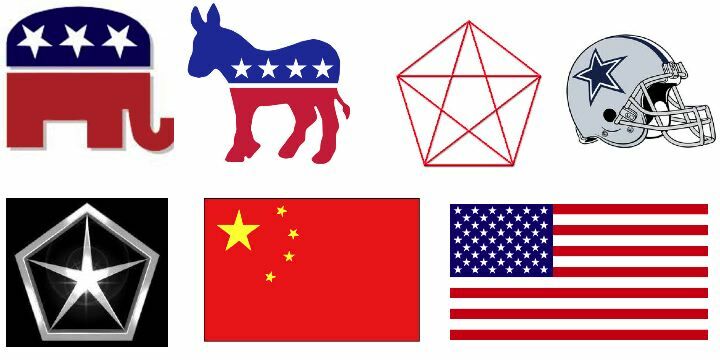 The pentagon and 5 pointed star (pentagram) are highly representative of the military and corporations, and are widely used in advertising, sports and politics. The flags of many nations contain 5-pointed stars. China’s flag has 5. The American flag has 50! EVERY BODY IS A STAR! 5 teaches us about the physical aspects of life, including our own physical bodies, the wellbeing of which is likely to be a major issue this year. The body is the vehicle which transports us through this journey called ‘physical life’, and we need to learn how to take proper care of it. 5 is the number of ALTERNATIVES – and various areas of alternative medicine are likely to make great inroads now as its practitioners expand their knowledge – despite the attempts of the pharmaceutical and medical industries to stop it. Alternative Fuel could significantly impact the energy industry this year – despite the attempts of big oil, coal and gas to stop it. Wherever we have been going wrong in the world and in our personal lives, the 5 energy enables us to find alternative routes and approaches. 5 is the number of CHOICE; the basis of freedom. As we become more aware of our true needs in life (as opposed to what the system tells us we need and then removes our choices) there is likely to be a great emphasis on the damage done to our food supply by corporations such as Monsanto, and the pollution caused by industry and consumerism in general. There is likely to be a LOT of anger as the truth finally sinks in and moves the population to change things. This is the year when PEOPLE really start to understand themselves, inside and out. 2012 is the year in which we have the opportunity to BECOME the change we want in the world. 5 is the number of CHANGE. 5 is the number of OPPORTUNITY. As our knowledge expands, we will find solutions. 5 is the number of RESOURCEFULNESS. For the past 12 years, ‘we the people’ have been rapidly developing our sensory system – our inner radar – the emotional circuitry which runs through the body and meets with the spirit in the heart. The heart is the point of LOVE within the body where the physical connects to the metaphysical – mind and emotion. It is from the heart that we develop perspective and broaden our view of life. People are realizing how limited and frozen our points of view have been. We have looked at life from the shallow standpoint of materialism but are realizing that our potential as human beings is so much more than that. Through the rise of our emotional feminine energy, we are feeling much more deeply into life. As we develop DEPTH through the love in our hearts, shallowness falls away and huge waves of heartlessness are exposed. Our hearts need to be reset because right now they beat in accordance with a dying system. Only warmth can counter coldness. Only love can counter hate. Heartlessness is life without feeling; light without love. Science itself is going to change because science made an assumption that is fatally flawed – that life on Earth is a purely physical experience. It is becoming increasingly difficult to explain the laws of physics without bringing metaphysics into it. The prefix ‘meta’ means ‘beyond’. In an interview with New Scientist Magazine this January, world famous physicist and author of “A Brief Moment In Time”, Stephen Hawking, was asked what he most thinks about. He answered, “Women. They are a complete mystery.” ..…and therein lies the biggest problem that science has. The inability to progress beyond the physical or even consider the essential role that feminine energy – emotion – plays in the fabric and vibration of life. The problems we created in the era we are evolving from will not disappear of their own accord. We cannot progress until we recognize our mistakes, learn from them, stop making them, and move in a different direction. We severely limit ourselves when we assume we should already know the answers. As evolving beings, the learning never ends. 5 operates by learning ‘from experience’ – from discerning what works and what doesn’t. 5 is the number of the inquisitive scientist – and in case you didn’t realize it, there is a scientist in all of us. It is that part of us that is looking for truth; the part of us that needs to understand. Life is one big road with lots of signs. In 2012, we will have an array of new experiences for which we have no previous experience to guide us. Some may be painful and shocking. Others may be exciting and joyful. Whatever the case, this year’s experiences will broaden our potential. 5 is the number of EXCITEMENT, ADVENTURE, CURIOSITY, and DISCOVERY, and it is important to remember that AWARENESS OF REALITY is the best safety net we could possibly have. The past, present, and future are converging in 2012, bringing us into present time in a most unusual, ‘strange’, and all encompassing way. Issues of the past are being buffeted into the present so that we can learn from them, heal from them, and create a future that is based on what we have learned. This mirrors the convergence of body, mind and emotion going on within our hearts. This activity will accelerate significantly in 2012. Memory Lane is a passageway to emotional healing, but we cannot dwell there. We must develop the firm intent to let the past go. The intent to heal all that unexpressed emotional energy is how the healing starts. Only then can we put the past behind us where it belongs, lighten our load, and move forward. We will learn this year, first hand, that what we did in the past creates the present and what we do in the present creates the future. 5 is the number of FREEDOM – and while it is true that freedom is what most human beings aspire to, we must be careful not to define freedom on too broad or narrow a scale. Freedom for one could feel like hell to another. As election after election takes place all over the world this year, the word freedom is going to be used, abused and twisted for political gain. The controlling few are trying to pull us back to the past, to times-gone-by, when people were so much easier to control. Be aware. A huge numeric shift took place when we moved from the millennial vibrations of the 1000s into those of the 2000s. This massive transfer of energy has taken us 12 of our linear years to acknowledge, feel and accept. Our evolution from 1 to 2 now brings us into the year the whole world has been waiting for. 2012 – the year in which whatever is going to happen will happen – but perhaps not in the way we expect. 5 is the number of the UNEXPECTED, the UNFORESEEN, and the UNPREDICTABLE. Those in control, the infamous 1% who cannot accept that they are part of the 100%, will do everything they can to prevent this shift from a purely ‘man’s world’ into a world brought into balance by an infusion of the feminine. Resistance to this shift is the fundamental cause of most of the turmoil going on in the world today. With all of its ups and downs and unexpected turnarounds, 5 is not the most stable of paths to travel. Anything can happen. The fact that 2012 is a leap year makes things even more shaky and volatile. Leap years occur every 4 years so that the calendar remains in alignment with Earth’s motion around the sun. An extra day is added – February 29 – and this ‘hiccup’ causes an energetic ‘wobble’ in the flow of time which cannot help but effect the flow of life. We last experienced a leap year in 2008 – a year of much upheaval in the world, the year the free market (capitalism) imposed its failures on the people in the form of bail-outs and so-called ‘austerity’ measures. 2008 was the year the sub-prime mortgage crisis impacted the USA and then the world. At the end of 2008, Barack Obama was voted the first black president of the United States, creating a massive rise in people’s feelings along the entire emotional spectrum. There was a lot of hatred mixed up in all that jubilation. 2008 was a 1 year in the world – an important BEGINNING to the current leg of our journey. It was the year in which humanity found the enormous power of emotion and, one way or another, was deeply moved. 2008 was also the year that 69,000 people were killed in one earthquake alone, in China, but we did not hear much about that enormous loss of life because of the cloak of secrecy under which China operates. It is safe to assume that Mother Earth will continue to move and shake in whatever way allows her to heal from the onslaught of abuse we have imposed on her, and continue to do! Notice that we are now at the halfway mark of the journey that began in 2008. 1, 2, 3, and 4 have gone. 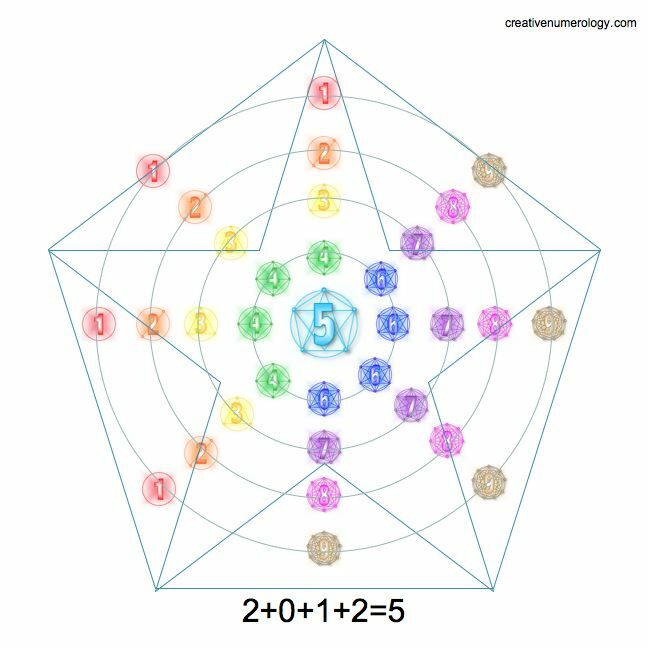 5 is dead center – the balance point – and 6, 7, 8 and 9 are yet to come. We now need to lean emphatically in the direction we want this journey to go. We are the only ones who can tip this delicate balance in the right direction. The last time we were in a 5 global year was 2003 – the year of the Iraq war. We have a chance to do things very differently this time around, as the very same arguments that took us into Iraq are now being made for an attack on Iran. Our millennial journey from 1 to 2 is taking us from secrecy and isolationism to openness and connection. It was secrecy that enabled the old system to flourish for so long. It is taking us from the big LIE that this crumbling system has always been, into HONESTY. Honesty is what feelings are. By the end of 2011, the people of China, Burma and Russia were spontaneously rising up against oppression and slavery. The emotional energy of the entire population on Earth has been moved by the pain of not being allowed to be the free spirits we really are. The 2000s ushered in an era of equality and balance in which the vibration of our feelings open the space that consciousness needs in order to expand. This is why women are under attack on so many fronts all over the world. The controlling few cannot allow feminine energy to expand because they are afraid that such an evolution, such massive change, would render them irrelevant. Feminine energy is our FREE WILL, and we are well aware that the WILL of the people is anything but free. It never was. In 2012, we will experience the power of our personal and collective WILL as never before. The battered, bruised and abused Will of humanity has a chance to heal now. Creativity and evolution are working together. They are part of the same process of growth, but at different speeds. 1 is the number of change through progressive, one-step-at-a-time action. 5 is also the number of change – the sudden and unexpected kind that occurs through seemingly random events. In this year’s convergence of time, it may be difficult to tell which is which. We must learn as we go in the 5 energy, so that our mistakes become channels of self-education, not self-torture. We allow ourselves to be beaten up by guilt, the only objective of which is to punish. Guilt is not an emotion. Guilt is judgment we make against ourselves, often without realizing it, which stops us from taking the most basic steps. We don’t need guilt to tell us what is right and wrong. We need loving intention in our hearts, and the desire to do the right thing no matter what the circumstances. If your idea of freedom excludes caring about others, denied guilt is in play. Denied guilt says “I don’t care about other people’s suffering”, but the love within really does care, and so love gets denied, too. There is no freedom in pure selfishness. 5 is the number of FREEDOM – not freedoms. By pluralizing the word freedom, we diminish its meaning and dilute its effectiveness. And by defining freedom for others is to deny freedom altogether. In 2012, it is not enough to simply talk about freedom. It is a year in which we must strive to be as free as possible no matter what our circumstances happen to be. We must encourage others to be free as well, even if their idea of freedom does not match our own. We must learn to live and let live. As this 12-year journey out of denial continues, not only are we coming face to face with our own guilt, but are also gaining a deeper understanding of the healing power of forgiveness. Life is too short to bear grudges. That is what keeps us locked in the past. Everyone is becoming more resourceful now, and there are likely to be some very convincing tactics used to sway people in one direction or another. Never forget that this failing system is engaged in a major war against each one of us – the war to capture our HEARTS and MINDS with misinformation and propaganda. What they did not bargain for or prepare for was the response of our emotions which represent TRUTH within. We must be very aware of those who are so afraid of losing possession and position, so afraid of change, so afraid of the unknown, that they will go to the most extreme lengths to prevent this natural change from 1 to 2, from alpha to beta, from imbalance to equality, from war to peace. 5 is the number of the unforeseen – the unknown, and people are very afraid of that. It took us 12 years into the new millennium to put 1 and 1 together and make 2, all the time wondering why the number 11 was so visible in our lives. It took us 12 years to connect the dots and accept that life as we knew it is over. Our task now is to create a new form of living based on what we have learned from previous experience which is supportive, not destructive. The damage done to Mother Earth will be more apparent than ever this year because 5 is the number of the physical, and Mother Earth is the physical plane that sustains us. Mother Earth is feminine energy manifest, and she is in the process of healing from the unrelenting abuse she has taken in order to feed our addictions. In traditional numerology, 5 warns against the over-use of alcohol, drugs, and gambling but, in the course of time, we have developed many other addictions, technological ones especially, from which we need to detach ourselves if we are to be free. This includes TV, the internet, phones and other devices which occupy our lives to an unnecessary degree and keep us tied to this collapsing system. Technology must have its place in the 2000s, but it must serve us, not own us. The principle characteristics of 2 include the chemistry that occurs when ideas and ideals, cultures and beliefs, gifts and needs are combined. 2 is the number of cooperation, not competition. 2 brings us from pure selfishness to truly caring; from isolation to connection. From I AM to WE ARE. That is the only way for the fabric of humanity to pull itself together and heal. This entry was posted in numerology and tagged 2012, 5, numerology, pentagon, pentagram, sacred symbols, symbols, year ahead. Bookmark the permalink. Wow! What a great article and so filled with wonderful, intuitive and factual info! Thank you Christine!! Thank you so much, Velma. I’m glad you enjoyed this. Such beautiful and true comments. Our family has been experiencing these changes for, just as you stated, 12 years, beginning with the birth of our son, to the collapse of my husband’s “job.” You explain so well the changes necessary and the uncertainty of the past “tried and true” methods that we all grew to depend upon. I have also noted a great shift in making peace with everyone I held a grudge against. It IS such wasted emotion. Better to forgive and understand oneself better than to try to “guess” someone else, and in the process the energy of peace is so much better able to flow. Finally, I wish to express my thanks for sharing this awareness of the feminine in our society. I LOVE that you brought this awareness to me through the science of numbers. Just love your blog. Thanks! P.S. 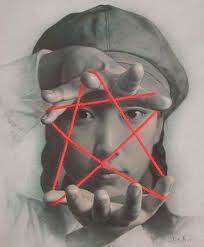 As an artist, I also enjoyed the drawing of the girl with the Pentagon. Great image! I’m so glad that you related so strongly. I love your take on forgiveness. It’s the only way forward. Anything else keeps us locked in the past. Hello Deb – 5 is the number of diversity itself and can therefore be a little confusing at times. But it is also the number of freedom, change, opportunity, the unexpected and the unusual, and personal expansion. Your personal year is always the same as the global year because your day and month of birth add up to 9 – and 9 always intensifies our lives. You’re used to it. Of course keep yourself safe. Of course protect yourself. But be prepared for an exciting adventure or two. Just remember that awareness is your best safety net!!! Your insight on this most powerful 5 universal year is indeed encouraging. The balance of the divine femininity and divine masculinity ushering in a new paradigm is what I discerned from this article. I feel this very strongly,due to the fact I have a life path of 5 and in a personal 1 year. Christine I truly see you. And may you have a Divine Year. This was everything I needed to hear and more right now. You have no idea the insight that this brings me in the depth of my emotions. Blessed be God! Bless you my love! …good to hear, Penny. Thank you! What a wonderful blog! !Can numerology tell when a person will die? Thank you Christine and have a wonderful year!! I don’t think so, Gale. Sometimes, however, you can look back and see the circumstances that led to the death. So I find it interesting that 2012 is a five year. I did not know that. Much of what is written in the article seems to reflect changes I am going through this year as well, so it will be interesting to see where things go. I love your pages Christine Delorey. You have me mesmerized with the way you speak, your ability to say the words that I can wrap my mind around completely and your incredible knowledge that can turn strong medicine into a sweet and powerful remedy. Number 8 should be a cakewalk. Good luck with 8 Donna. And thanks for such kind words. I’ve been reading a tremendous amount of material recently that all sounds the same. Your analysis of our current moment covered so much in a truly accessible way. Thank you for sharing your knowledge and understanding! Thanks Jolie, I’m glad this is helpful. glad you enjoyed it, Graham. We have November in common, and the 1950s. Kahlil Gibran, Joel Goldsmith and more. Your word are pieces of crystal that move the spirit forward while healing the soul of pain and revealing the true face of guilt. Blessings to you. I’m so glad you are enjoying this work. Your words are much appreciated. Thank you Brenda.